Pencil sketched newborn image with jungle animals - Newborn Photography | Schedule Your Newborn Shoot Today! I love to create unique editing effects for my clients newborn images. One of my favorite techniques is the colored pencil effect like I applied here on this photo of a sweet newborn sleeping with his jungle animals. Isn't he so precious and sleepy? This sketched technique makes the image appear as though it was hand drawn using a colored pencil. In order for you to see the sketched detail, this image always looks best printed in a large size. I also recommend getting it printed on canvas which will add to the textured effect or on a premium framed photo print. This is one of my favorites to recommend for the nursery as there is something about the finished image that just feels whimsical and child like. 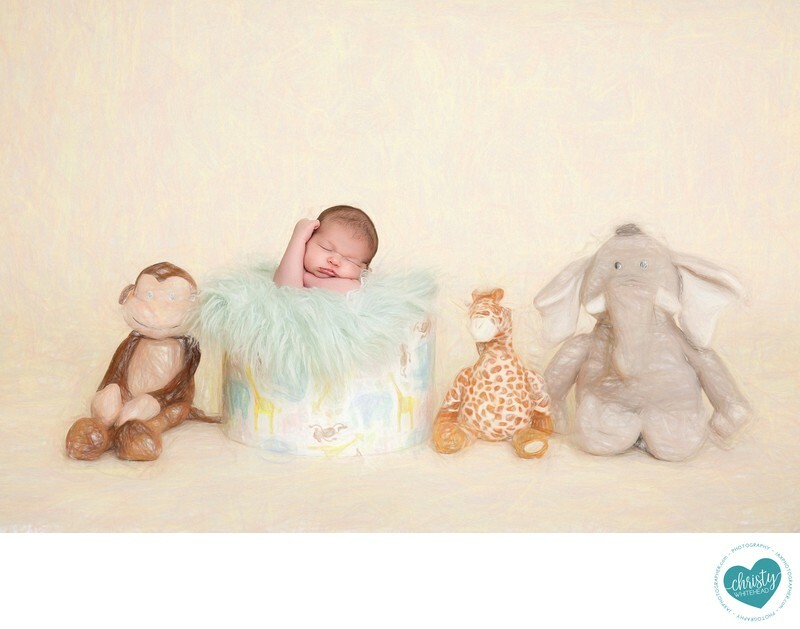 Another unique editing technique we can apply to your newborn photo is a painterly affect that will make your images appear as though it was hand painted.